I don't know what the weather was like on your side of the world this weekend, but we had 65+ and sunny both Saturday AND Sunday. I haven't been in this great of a mood consistently for months -- warm weather is my happy place. It probably helps that we road tripped to Lexington to see Warren Haynes on Saturday (SO good! ), and I spent Sunday taking photos/eating brunch at my favorite spot. Y'all, this weekend was pretty much a dream. I need this kind of weather to stick around! 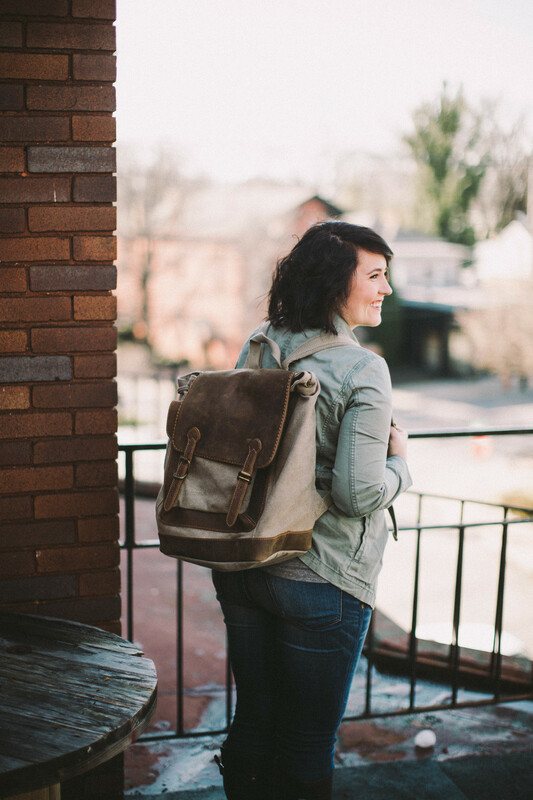 Speaking of taking photos on Sunday, this Kelly Moore backpack that I'm rocking in these photos is one of my favorite things that I own. It's a backpack turned camera bag that has sections for lenses, memory cards, batteries, and what really sold me was the fact that it also has compartments for your laptop and chargers! I wore it all afternoon yesterday, and it seriously made lugging all of my equipment around so much easier than using a typical camera bag. Not to mention I'm all about supporting small made businesses, which brings me to one of my favorites; this v-neck from Mulberry Press Co. This t-shirt is pretty much the best. It's super soft, loose fitting, and come on, who doesn't want to feel like a dream chasing, hustlin lady all the time? There's really not much else to say about it except for that I've pretty much lived in this outfit lately. Who doesn't love a good layered look? Especially with Spring (hopefully) just around the corner!